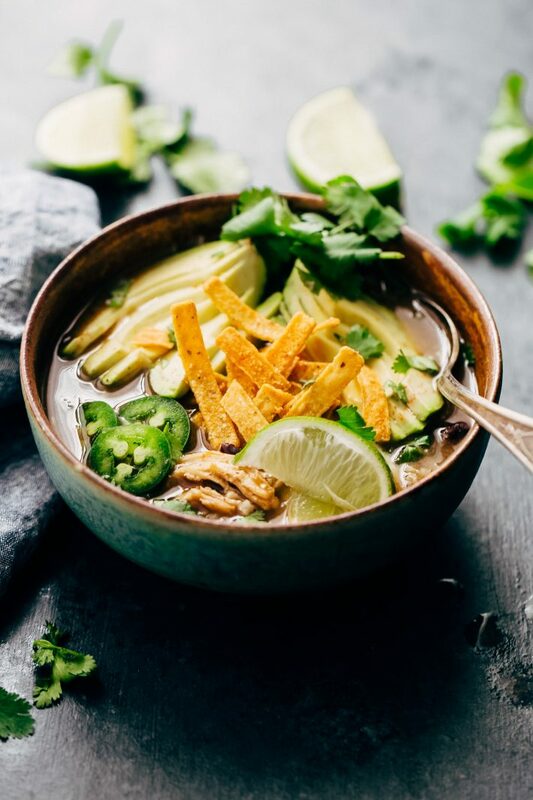 Verde chicken enchilada soup that takes in the ballpark of 30 minutes to make is perfect for quick weeknight dinners and lunches the next day! A few store-bought ingredients help bring this soup together in a flash! My mouth cannot get enough of all this flavah. 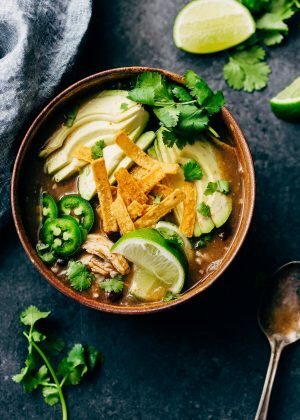 A hearty, slightly spicy verde chicken enchilada broth with tons of cooked rice, black beans, shredded chicken and all the toppings your heart desires. It’s a lively, stick-to-your-ribs bowl of soup that takes in the ballpark of 30 minutes to make when you accept a little help from the grocery store. It’s extra thick, a bit tangy from the tomatillo scent broth, and just the right hint of spice. Don’t you love it when you mess up a recipe, and it happens to turn out better than what you had originally intended? <– mind you, this rarely ever happens. 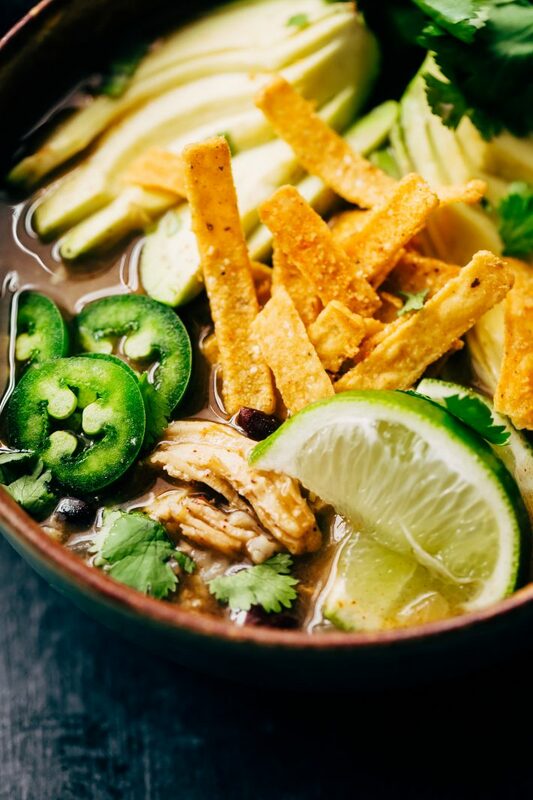 And though I was pretty sure, we’d call it lunch and then I’d have to retest this recipe yet again with the red sauce variety, to my surprise, the hubby and I both loved verde chicken enchilada soup just as it was. As I was starting to feel comfortable with the idea, it hit me. It’s not exactly the kind of recipe that appeals to the masses because of one major flaw. Sure it tastes great, but verde enchilada sauce isn’t exactly winning any awards in the looks department. In fact, it’s not even verde in color but more of a muted greenish-brown hue that doesn’t excite anyone. But oh my friend, I urge you to look past this soups less than perfect outward appearance and taste it for what it is. 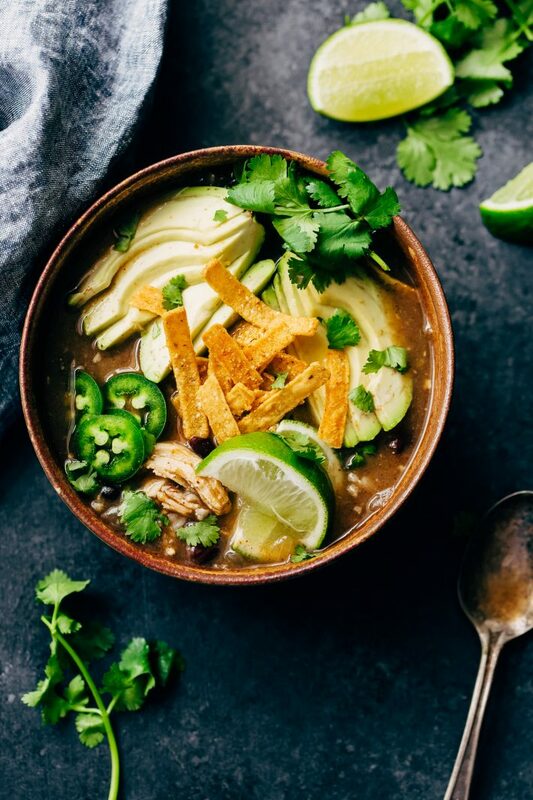 Green chili and tomatillo flavored base with beans and rice and shredded chicken, a squeeze of lime and crunchy tortilla chips all smoothed out with sliced avocados and earthy cilantro. And on a cold, rainy afternoon, it’ll treat you just right. 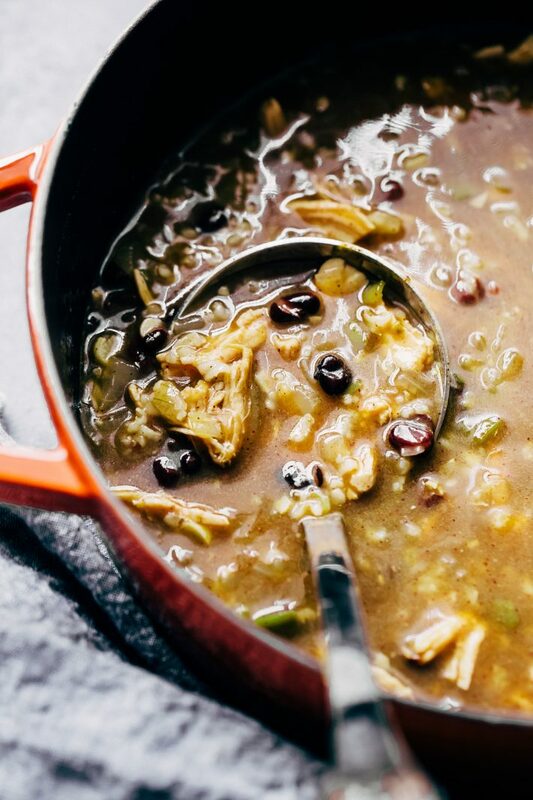 What I love most about this verde chicken enchilada soup is that it takes in the ballpark of 30 minutes to make if you’ve got leftover cooked chicken and brown rice that are demanding to be used up. Weeks where I’ve got my life together, I’ll roast a chicken  for Friday or Sunday night and then use the leftover chicken for quick meals throughout the week. Other times, I’ll shred that chicken up and pop it in the freezer for when I’m crunched for time. It comes in handy for things like this quick soup! If this isn’t you, grab a rotisserie chicken on the way home with a bag of frozen cooked rice, and you can still put this meal together in no time. Verde chicken enchilada soup requires a chopped onion and a couple of jalapenos that get sauteed with minced garlic. You can swap the jalapenos for poblanos or even bell peppers if you’re worried about it being too spicy. Feel free to used minced garlic in a jar and pre-chopped onions from the refrigerated veggies section. This is meant to be an easy verde chicken soup! Shortcuts aren’t just allowed; they’re encouraged. And there you have it! 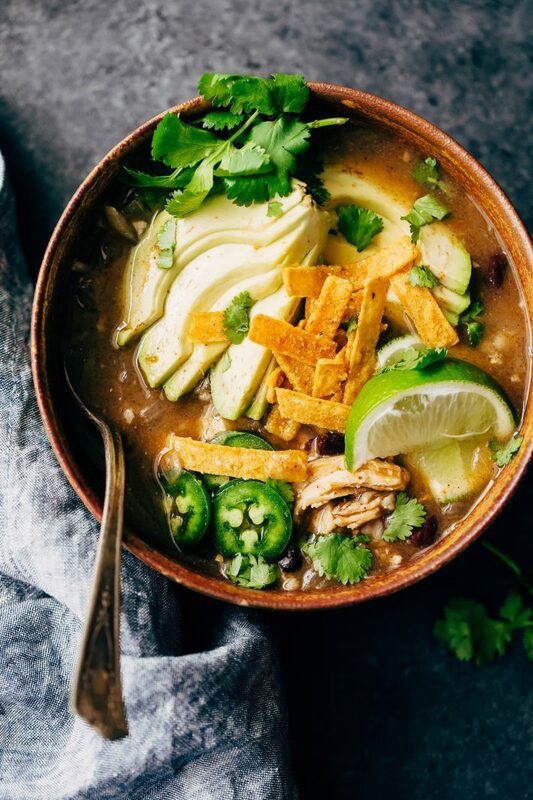 My verde chicken enchilada soup is warm and cozy. It’s just the right amount of spice from the jalapenos and chili powder without being too overwhelming. The avos do help smooth it out a bit and add tons of creaminess. Feel free to swap out the brown rice for quinoa or white rice if that’s more your thing. Now sit back, enjoy the spring showers (or mountains of snow if you’re still getting more), grab a blankie and soup bowl full of this goodness. Add a swish of oil to a large dutch oven or soup pot over medium-high heat. 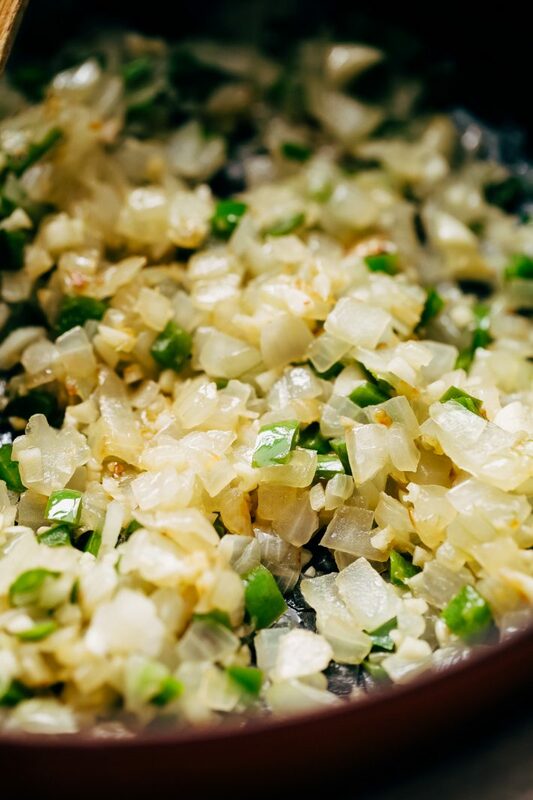 Add onions and jalapenos and allow them to cook for 5-7 minutes or until they soften, adding in the garlic during the last 30 seconds. Add the cumin, chili powder, salt, enchilada sauce and chicken broth and allow the soup to come to a simmer before stirring in the rice, beans, and chicken. Let the soup come back to a simmer, then lower the heat to low, and let it all just hang out for 12-15 minutes so the flavors mix and mingle. Turn off the heat, stir in lime juice (depending on how much you like) and chopped cilantro. 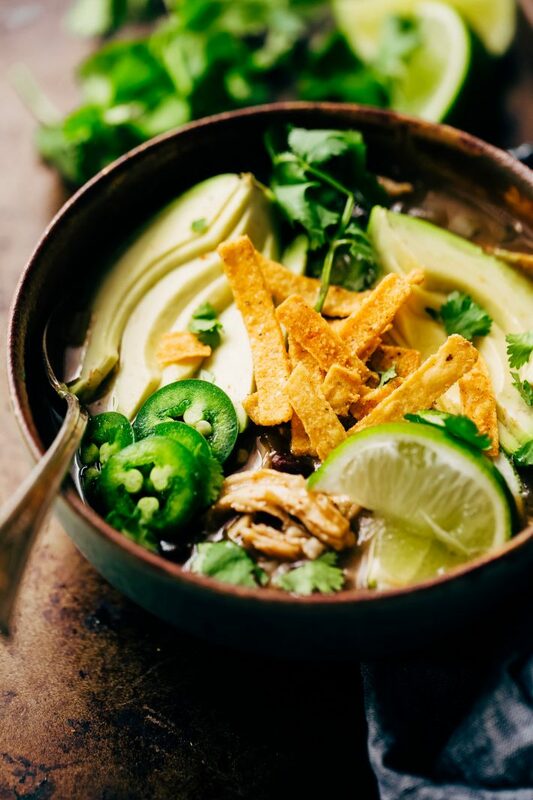 Serve warm topped with tortilla strips, diced avos, more lime wedges, jalapenos, and additional cilantro! you can replace the jalapenos with one mild poblano or bell pepper if you’re worried about the spice here. You can also cut back to just one pepper if you want this milder.